Here’s my review of Microsoft’s Lumia 950. I’ll be honest, I normally carry an iPhone (6s Plus) and some sort of Android device (lately a LG G4 or Nexus 6P) around with me. I only play with Windows Phones when I have a unit that I’m reviewing. This will help you understand the type of shades I’m wearing when I look at a Windows Phone - you'll understand where I’m coming from. I recently received a Nok- I mean Microsoft Lumia 950. I’m currently working on a full review but since Andrew is on vacation I figured I’d share some first impressions. Full disclosure, these are MY FIRST impressions and purely anecdotal - chances are they’ll be completely different from my review which I’ll publish in a few days. Recently, I started cooking with my cast iron cookware. Unlike 'regular' Teflon coated pans, cast iron can handle temperatures of 600+ degrees. While cooking at 600 makes for some tasty, juicy food, the heat blows more smoke than a politician. There's enough that it usually sets off my smoke detector. This is a problem when you have young kids in the house as the beeping from the detector will wake them up/scare the hell out of them. Still, I put up with this until one night at 5AM one started to beep because the battery needed to be replaced. That was the last straw - I decided I needed a smarter smoke detector that would politely alert my phone when there was a problem rather than me having to figure out what's going on. Oh and in case you're wondering, I have a fancy range hood fan. I know, I know... the very premise of lists like these is faulty. Who could possibly be so presumptuous as to survey the vast and diverse market of smartphones, the most personal of personal computers and tell anyone what's "best" for them? When we talk about Android flagships, each year HTC is usually one of the first names to pop up. However, 2015’s flagship, the One M9, has been maligned a bit in the media because it’s not that much better than it’s predecessor, the M8. While it ships with a more powerful SoC, due to heat issues, it rarely gets a chance to stretch its legs; the camera, while higher resolution doesn’t take very good pictures. That sort of thing. Fortunately, HTC usually releases something interesting in Q3/Q4. Previous Q3/Q4 releases include the HTC Butterfly (one of the first 1080P phones), HTC One Max (their first phablet) and the Nexus 9 (their first tablet in a while). Since the M9 is the most maligned HTC flagship in a while, they’ve decided to market their Q3 curiosity as their new flagship. To continue our celebration of the holiday season here on HowardForums we're giving away a Nexus 5X! Before entering, please check out our review. To enter you can leave a comment on this post, like us on Facebook and like the link to this post that appears on our Facebook page, or follow us on Twitter @howardforums and tweet a link to this post with #HoFoNexus5XGiveaway. Any one will give you an entry, two or all three will give you that many chances to win. Bonus: if you are a HowardForums Premium Member you will automatically get an extra entry (for it to count you must enter in at least one of the aforementioned ways)! If you are not currently a Premium Member you can sign up or renew here. Contest ends on Monday December 14th at 9:00 PM Pacific and the winner will be chosen randomly afterward. If the winner does not respond to us within 24 hours of being contacted, a new winner will be chosen. ***Contest Rules and Terms: Contest is open to U.S. and Canada users who do not reside in Quebec. If a Canadian wins they must answer the skill testing question: "What company manufactures the Nexus 5X?" U.S. winner will be responsible for all taxes and customs. Carrier compatibility not guaranteed. Odds of winning depend on number of entries received. Only one entry per method described above allowed. Contest not open to HowardForums staff and their families. Rules and Terms and contest details can be modified at our discretion at any time and without notification. Having missed the boat on the Nexus 6 launch last year I have to think back even further to the 2013 Nexus 5, remembering that it took the big ROM developers of the day a couple of months to produce stable custom firmware for Android KitKat. Cut to late 2015 and there are already two major ROMs available for late-model Nexus phones—and at least one of them is fantastic. CM13 is the Marshmallow-powered version of CyanogenMod, and nightly versions for select devices are now ready for download. CM is one of the few (perhaps only) custom ROMs where OTA updates actually work, meaning that you won't have to back up and restore your apps every time you flash a new update. Here I am, almost a full year later when Howard asked me if I wanted to try out the new Motorola 360 2nd Gen. I immediately said yes because I still use my 360 Gen 1 daily. Howard Reviewed the 2nd Gen 360 already. He basically gave it 3.5 out of 5 saying it could look better and was expensive. acurrie also had a look and shared his thoughts as well and being a self admittedly non wearable guy didn't really like it. I don't particularly like expensive phones. I made no attempt to hide my disappointment last year when Google and Motorola decided to go upmarket with the Nexus 6, and I'm similarly nonplussed that Huawei is continuing that tradition with this year's 6P. Slap a case on that premium metal body and it pretty much becomes irrelevant, and you're left with just another big phone. A big phone without wireless charging, without OIS. But with crazy-fast USB charging and the best camera sensor ever seen on a Nexus. A big phone with the latest version of unadulterated Android and an unlockable bootloader. Plus a fingerprint reader that you'll quickly wonder how you ever did without. You could also call this Custom Android without the Custom ROM - Part 3. See Part 1 and Part 2 if you missed those posts a couple of weeks back. So a big battery can make a big difference... Who knew? The 3450 mAh battery is certainly a big selling point for the Nexus 6P—beefier than the 3220 mAh cell on the Moto Nexus 6 and not even in the same league as the 2700 mAh Nexus 5X. For our American readers, I'd say that battery size alone would justify the $70 USD premium over a 32GB 5X; for Canadians that same premium balloons to $140 CAD. It might still be worth it if you consider the 6P's other charms. One of last year’s most interesting phones was the OnePlus One. It was tailor made for enthusiasts; it packed flagship level specs with the popular Cyanogenmod operating system all for a very palatable price. To top it off, you needed an invite from OnePlus before you could buy one. Of course, one requirement to being an enthusiast is having a short attention span so now we have the One’s follow-up: the predictably named OnePlus 2. 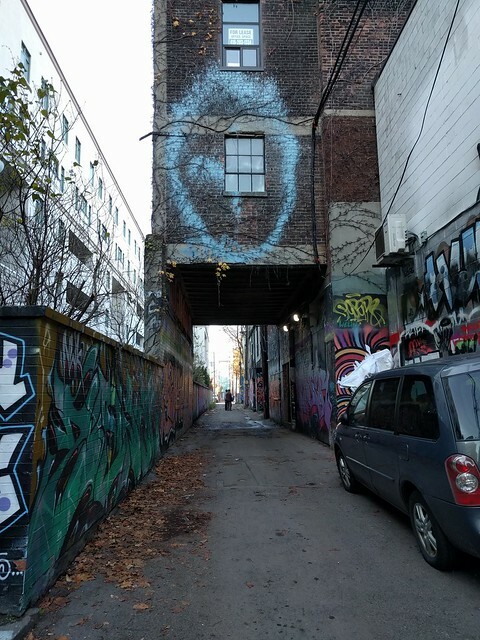 Time for another graffiti walk through the back alleys of downtown Toronto's Fashion District, this time with the Huawei Nexus 6P. You'd be forgiven for confusing this Flickr album with the same gallery from the Nexus 5X; lighting conditions were pretty much the same, and the 5X and 6P share pretty much the same camera and sensor. You can at least compare the 6P's results with those from the OnePlus One and LG G2 (2013 Nexus 5). My preferred home screen and wallpaper of choice... Oh look, there's Helsinki and Mauritius. Anyway, my unprecedented quality time with the Nexus 5X is coming to an end. I'm not going to lie; it's taken a fair amount of willpower to ignore the more expensive 6P also in my possession. But I feel very strongly that having a firmer grasp on this cheaper Nexus will help better ascertain its value, and whether or not the 6P is worth the extra cash. Today we discuss what I think is the 5X's biggest shortcoming. It's not the 1080p LCD display, which could perhaps do better in bright sunlight but is otherwise fine. It's not the speaker—even a single front-firing speaker sounds better to me than any of the bottom-firing speakers I've put up with prior to my Nexus 6. The last few ZTE phones that have come across my desk were all outstanding phones for the money. The problem with this is that the people that typically buy those kind of phones have no idea who made it. If ZTE wants to move upmarket, they’ll need to replicate their formula of offering more phone for less dough. 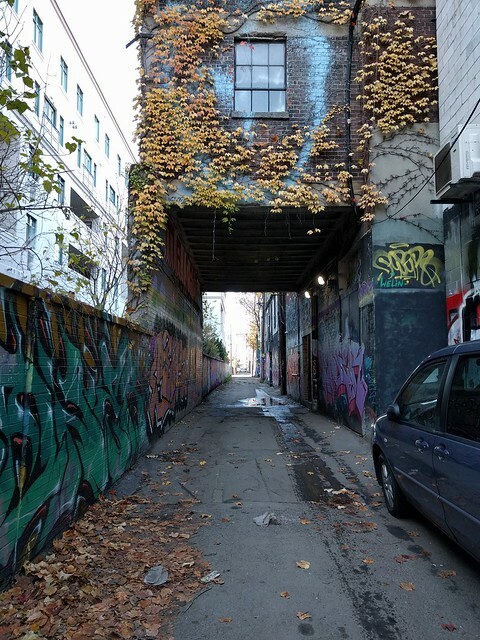 Time to see what the 12.3 megapixel shooter on the back of the Nexus 5X can do—and for that we head to Graffiti Alley, in the Fashion District of Toronto. The 5X is a pleasure to shoot with. Google's camera app fired up quickly and captured shots without pause. The very handy shortcut of double-pressing the power button gets you to the camera even faster, without the security hole—exiting the camera app without unlocking the phone brings you right back to the lockscreen, every time. For the next two weeks (I think) I have both the LG Nexus 5X and the Huawei Nexus 6P in my possession. As the means exist to root and theme Android's latest iteration, I'll be making each Nexus my full time device in turn, and reporting my findings here. Remember, I don't do phone reviews—instead, consider this an ongoing journal of observations from a hard-core Nexus user.